UPDATE 1600 GMT: Riad Hijab, the coordinator of the opposition-rebel High Negotiations Committee, has warned that the ceasefire is near collapse. After a meeting with French Foreign Minister Jean-Marc Ayrault, Hijab claimed 90 airstrikes on 50 opposition locations. Hijab said the Syrian military and its allies are reinforcing across the country in preparation for attacks, with an influx of heavy weapons, mortars, and tanks. Britain and France called on Thursday for an end to attacks on Syria’s opposition by Russia and the Assad regime, which are continuing despite a ceasefire that began last weekend. UN envoy Staffan de Mistura maintained that the cessation of hostilities had made “visible progress”, even though the Syrian military has pursued ground assaults in five provinces, with cover from Russian warplanes in some of the assaults. We ask all sides that are committing human rights violations, including Russia and the Syrian regime, to put an immediate end to the attacks against moderate opposition groups. Tomorrow is an opportunity for the leaders of the UK, France and Germany to come together…and make very clear to [Russian] President Putin that we need this ceasefire to hold, to be a lasting one and to open the way for a real political transition. De Mistura said the level of violence in Syria had been “greatly reduced” despite the attacks near Damascus and in Hama, Homs, Latakia, and Idlib Provinces. “In general, the cessation has been holding,” he asserted. However, the leading rebel faction Jaish al-Islam said: “Our confrontations with the Assad gangs did not stop, whether in the Ghouta [near Damascus], in Homs, or in Aleppo, and as far as we are concerned, the war effectively did not stop on the ground in the shadow of these violations”. The regime has been launching a fierce attack on the area for more than four months. We were surprised that after the declaration of the truce by the international community that this attack continued and the Assad forces took new positions in the area. Jaish al-Islam warned that a ceasefire where “militias and states kill our people, expel them and occupy our land” was tantamount to unacceptable surrender “after all this blood that has been spent”. The Syrian Network for Human Rights reports that 19 medical and civil defense staff were killed in February by pro-regime forces. Thirteen of the staff — a doctor, six nurses, four other medical personnel, and two civil defense workers — were slain by Russian airstrikes. 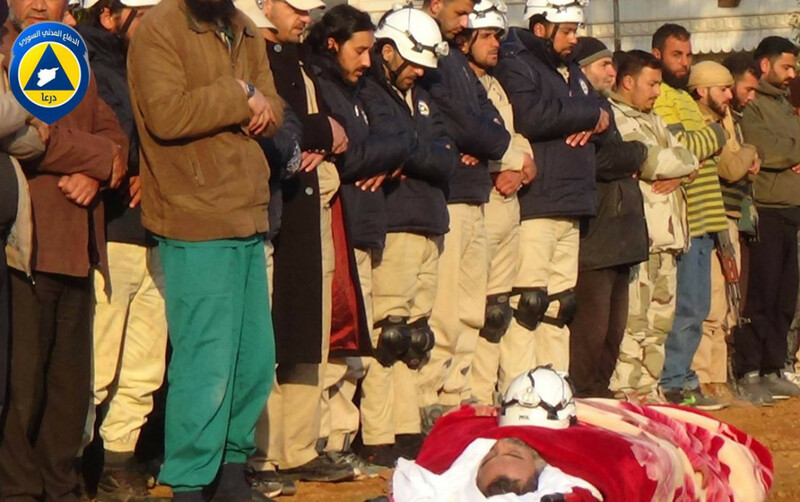 The Syrian military killed a nurse and five civil defense workers. Two other volunteers were killed by the Islamic State. Opposition protests across the country are the largest in months.